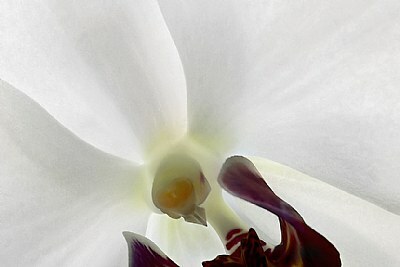 About The beautiful orchid is too beautiful. So when I take a portrait of this flower I am disappointed usually because the reality is better then my photo. But among its nice shapes and colors are often hidden appearences, illusions and sometimes a good omen also. Beautiful and creative flower! Hi Giuseppe, you are perfectly correct about the orchids - I too found that what you see, and what you get in the photo is more than often not equal - the 2d format of photography really prevent us to portray these 3d marvels of the botanical kingdom! You succeeded very well in this instance to bring that hidden beauty to the fore - fine work! A harmoniously causing picture composition. Thanks Anne for your interest for this a bit strange floral photo. I paid a visit to your home. You seem to amuse yourself with pictures always different, well taken and often creative. I have enjoyed the tour. wowww !!!... the 'vision' you created with the angle of the shot is just WOW !! !..